Fifth-year gymnast Alex Zois has topped the all-around category in nine of the team’s 14 meets this season and earned East Atlantic Gymnastics League First-Team honors in all-around, vault, uneven bars, balance beam and floor exercise. 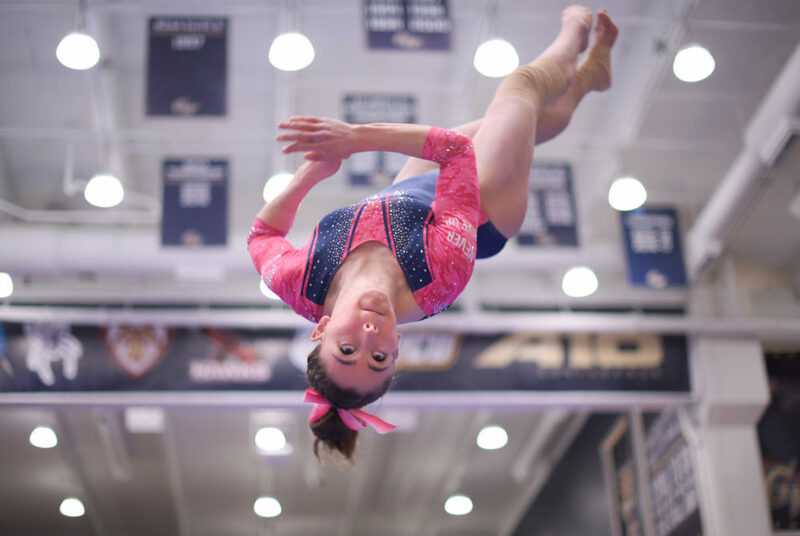 Fifth-year gymnast Alex Zois has battled through two season-ending injuries during her time as a Colonial. But for her last year, she has come back better than ever to end her career on a high note. Whether she is sticking a landing on vault or flawlessly executing a floor exercise routine, Zois shows up to every meet at the top of her game and leads GW as a team captain. Her continued ability to perform at the highest level in all events made her the clear choice for this year’s Best Female Athlete. Zois has topped the all-around category in nine of the team’s 14 meets this season and earned East Atlantic Gymnastics League First-Team honors in all-around, vault, uneven bars, balance beam and floor exercise. She captured her third EAGL Gymnast of the Week honors of the season after she nabbed a first-place finish in GW’s final regular season meet of the year earlier this month. Her 39.425 mark matched her career-best score in the all-around. Even with interruptions to her gymnastics career, Zois’ list of achievements is impressive. After sitting out her rookie season with an injury, Zois tied for first place in the 2016 EAGL Uneven Bars Championship as a sophomore. Her showing season earned her a spot on the All-EAGL First Team in the event. Zois helped the Colonials clinch a spot in the NCAA Regionals this season with a first-place showing in the all-around at the EAGL Championships, and her league-leading 39.305 national qualifying score in the all-around this season earned her EAGL Gymnast of the Year honors. Zois’ teammates have called her work ethic “relentless,” and head coach Margie Foster-Cunningham said Zois has handled the pressure of elite gymnastics “better than anybody,” and we can’t help but agree.